North Texas… ‘ I saw the anytime “. “Anywhere’ and I need then now” said Annette B of Haltom City as she looked at the torn page from the phone book. It read: 24-hour locksmith. Available within 15 minutes. And it seemed enough. Annette B needed someone in a hurry to replace the locks on a storage area someone had broken into. What she didn’t need was a scam artist. Their as looks legit, but investigators say its part a large scam run out of New York. The person who responded to Annette’s call was mangling her door handle as he told her his rates would be three times higher than he quote. You can check 1st Choice Locksmith, LLC Licensed Number B12827 and other locksmith you can trust at Texas Department of Puplic Safety. Before Using a Locksmith, make sure that they have a Locksmith License. Below are links to various news outlets, consumer protection agencies and state Attorney General offices addressing the issue of locksmith scams. The story is familiar in many states: an out-of-state company hires many unscrupulous individuals in the area to sub-contract its work using assumed business names, fake addresses and phone numbers. Many times, consumers have been over-sold, under serviced, or just plain lied to! The Illinois Attorney General filed criminal charges against a New York locksmith operation for setting up phony storefronts with unlicensed individuals practicing locksmithing that lead consumers to believe they were dealing with local companies. The action was successful, and the company was ordered to pay thousands in restitution, to cease operations and to no longer do business in the state under a new name or any of the 25 different names the company had been using in local telephone directories! ALOA encourages locksmiths who are facing this same situation to go to their state’s Attorney General who can take the appropriate legal action against these fraudulent companies. ALOA recently sent a letter to all Attorneys General urging them to pursue this matter in their state. There are a number of blogs, postings and general online chatter lately about the continued threat of ““phony locksmiths” Otherwise known as scammers degrading our industry. Many locksmiths have come up with ways to combat the problem. 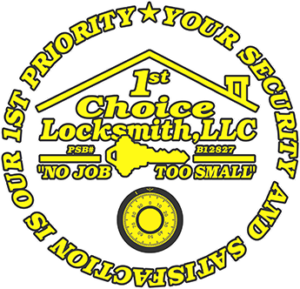 1st Choice Locksmith has taken steps to help raise the issue before the public and proper authorities. From the beginning, ALOA (Associated Locksmiths of America) has recognized that the first short-term strategy for us is to make locksmiths and the public aware of the issue. Only through education can we teach people to be wary of the 1000 listings in the phone book when the population of their city is only 400! Websites such as ALOA (Associated Locksmiths of America) find A locksmith are a great way for the consumer to get a legitimate security professional. Three years ago ALOA (Associated Locksmiths of America) set up a website for locksmiths and consumers to explain the problem and give them the resources to notify the proper authorities. ALOA (Associated Locksmiths of America) feels the long-term solution is found in locksmith licensing. Many of the states with current laws are changing their advertising requirements and fine structure to really address the issue of the false addresses (California and Texas). And the current locksmith licensing bills in Florida, Georgia, Maryland and Oregon also include such language. If you are one of the many consumers who have recently been taken advantage of by a “phony locksmith”, this page will take you directly to your state’s Attorney General Consumer Protection website where you may file a complaint. These “phony locksmith” companies purposely manipulate phone book and Internet listings with multiple false addresses and phone numbers to make it seem like a neighborhood business. Consumers are calling out-of-state operations that are not locksmith companies. The consumer is quoted a reasonable price over the phone, but when a person posing as a locksmith finishes the job, the consumer is charged a considerable amount more for unnecessary and/or sub-standard work. The complaint heard most often by consumers is for car openings. The price quoted over the phone to stranded motorist is around $45. When the individual arrives and unlocks the car, he hands the motorist a bill for $135 – $150. This unscrupulous individual tells the frustrated consumer that the $45 was just the service call and that it was another $90 – $100 for servicing the lock. ALOA has record of a number of incidents of elderly consumers locked out of their homes and being charged $900 to $1700 to replace a $12 lock. These out-of-state operations are set up solely to make money by purposely defrauding the public. Click on here to be taken directly to a website that will provide you all the information you need to file a complaint for the State of Texas. If you were a victim of a phony locksmith who’s contact information you received off the Internet, contact the FBI Internet Crime Complaint Center by clicking here. Not Familiar with Your Area. To ensure that the company is local, make sure that they are familiar with your area of town. ALOA Logo. Does the Yellow Pages ad contain a logo that makes them appear to belong to ALOA? While many locksmiths do belong to the Association, some unscrupulous individuals trick the consumer by falsely using the ALOA logo. You can always check to see if in fact these businesses are members by calling ALOA, (800) 532-2562 or www.findalocksmith.com . Unclear Business Name. Look closely at the ad(s). Is the specific name of the business clearly identified? Does it appear that the dealer actually operates under several names? If a Web address is listed, does the name on the Web site match the name on the ad? Service Vehicle. Some legitimate locksmiths will work out of a car or unmarked van for quick jobs, but most will arrive in a service vehicle? Identity. A legitimate locksmith should ask for identity and some form of proof that you have the authority to allow the unlocking to be done. You have the right to ask for the locksmith’s identification as well. Does he have a business card? Does he have an invoice or bill with the company name printed on it? Does it match the name on the service vehicle or uniform? Estimate. Find out what the work will cost before you authorize it. Never sign a blank form authorizing work. Invoice. Insist on an itemized invoice. You can’t dispute a charge without proof of how much you paid and what the payment was for. Refuse. If you are not comfortable with the service provider, you can, and should, refuse to work with the locksmith. Check for a valid state license number. The states that have licensing for locksmith services ( AL,CA, IL, LA, NJ, NC, OK, TN and TX ) may require the licensed locksmith company to include a state license number on their vehicles, advertising, and all paperwork.